Lanza also exerted influence on the tenors following him from Pavarotti to Andrea Bocelli who credit Lanza as inspiration in their pursuit of chosen careers. Hill Station, a fine-dining restaurant in Baguio City, mounts its third and last “Classics at the Hill” for this summer with “Reminiscences: A Tribute to Mario Lanza” on June 27, Saturday, at 8 p.m. at its Justina Garcia Function Room. Hill Station is inside the heritage building of Casa Vallejo, Upper Session Road. Featured artists are: soprano Stephanie Aguilar, prizewinner at the 2012 Jovita Fuentes Vocal Competition who debuted as Micaela in George Bizet’s Carmen with the UST Symphony Orchestra; tenor Nomher Nival, grand prize winner of the 2007 National Music Competition for Young Artists (NAMCYA) and the 2015 Jovita Fuentes Vocal Competition (male category); and pianist Gabriel Paguirigan, a virtuoso in the making and first prize winner in the 2011 NAMCYA piano category and grand prize winner, Philippine Philharmonic Orchestra piano competition. 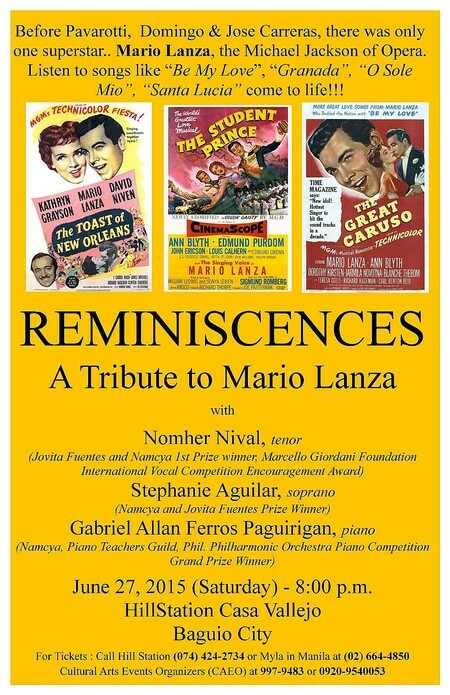 “Reminiscences” is a production of Hill Station, the Cultural Arts Events Organizers (CAEO) in cooperation with Iggy’s Inn, Manila Chamber Orchestra Foundation, National Commission for Culture and the Arts and the Philippine Amusement and Gaming Corp.
Tickets are pegged at P500 each. For more details, please call Hill Station at (63 74) 424-2734 or (63 2) 664-4850 or CAEO at (63 2) 997-9483 or (63 920) 954-0053.